TBG is a volunteer-based organization that relies upon volunteers to help run our many programs and events and to meet our goal of delivering horticultural information and services. We highly value our volunteers and could not run our many quality programs and events without them. Our volunteers take a great deal of pride in their many contributions to our organization. They strongly support our goals and are members of the community that we serve. All of our volunteer roles involve representing TBG to members of the public and are for individuals who like meeting people and who have good communication skills. You also need to be comfortable with email and using online scheduling systems. Roles often involve working with other volunteers, and many rely on specialist skills/experience and/or need a commitment of at least 6 months. Training is provided, tailored to the role. Some volunteers assist in many roles and there is a wide variety of positions to help, something for everyone! Please read on for more information. We are looking to increase our team of Tour Guides and Garden Ambassadors, particularly for weekends June to end September, full training will be provided, see below for more details about these very educationally focused roles. Many of our volunteer roles are unique, the result of finding a volunteer with the particular skills and background to meet a specific need. If you don’t see the role you want listed here, it’s still worth giving us a call! Our main volunteer roles are listed below; all our roles are accompanied by the appropriate training. Volunteering in our beautiful gardens: Volunteers assist the head gardener in the care and maintenance of our beautiful gardens. This is a very physically demanding role requiring good physical fitness, including the ability to bend, lift, and kneel, the stamina to undertake physical work for a 4-hour shift, and the hardiness to function outdoors in all weather conditions! Volunteers are asked to commit to a regular weekly 4-hour shift (8 a.m. to noon Tuesday, Wednesday or Thursday) for the gardening season (April to September, recognizing that vacations/other commitments may require flexing this schedule from time to time). Training and supervision provided. An orientation session was held in April for all volunteers interested in this role, spots for 2019 gardening season are now filled. If there is a need to “top up” members by mid-summer an additional orientation session will be scheduled. Watch for news about this on this website. Our Children’s programs are among our most physically demanding programs: good physical fitness, including the ability to bend, lift and walk up steep slopes is necessary. Volunteers require the ability to relate to children of all ages, as well as having patience, creativity, excellent communications skills and a passion for nature/horticulture. The programs take place both indoors and outdoors throughout the year. Programs run Mondays to Fridays and special events take place on the weekends. Adult Education Course Ambassador: Course Ambassadors take on the role of greeting students, handling last-minute arrivals and/or course fees, taking attendance and assisting the instructors where appropriate. This role is typically evenings and weekends and most classes are free for the course assistant in attendance. TBG Tour Guides lead garden tours of the TBG gardens and Edwards Gardens, as well as Wilket Creek Ravine and the Toronto Music Garden. Excellent communication skills is a requirement for this role together with a love of meeting (and educating) people. This role entails ongoing learning (keeping up to date with what’s in bloom and other garden news of interest) as well as a degree of mental agility, adapting and tailoring the wealth of information in the tour script to the needs and interest of the group you are leading. There are opportunities to work with groups of seniors as well as visiting school groups with curriculum linked tours on offer for the latter. Basic gardening knowledge would be an asset but not essential. Thorough training and support is provided to get you started in this rewarding role. If you are fluent in another language, we’d welcome your ability to translate our tours for visiting groups. This team run the library services such as borrowing, cataloguing, indexing, data entry, advising visitors, handling book donations and library displays. Some knowledge of library classification systems would be useful but not essential. This role would be enjoyed by someone who has an ability to work well in a team, handle large quantities of data and has good organizational and administrative skills, is comfortable working with computer systems, has a desire to learn and keep up with technological skills as well as good communication skills and the ability to interact with borrowers in a courteous, professional manner. Can you spare 3-4 hours to help? TBG has lots of worthwhile and fun volunteer opportunities available. In early January we typically start to add to our number of volunteers who would like to be involved with our special events. Pre-event training is provided for all our main special events. Special events also includes helping out at lectures (generally held weeknight evenings), and several fun roles on Thursdays helping our Farmers Market (see below) and Gardens of Song events. Most roles are representing TBG, helping with setting up pre event or taking down post event and taking registrations. All have a high degree of interaction with members of the public and most are out of doors activities. This is a roving, on your feet, outdoors in our gardens role. As a TBG Garden Ambassador you will be out in our gardens on hand to greet visitors warmly, offer assistance, information, and education. Stationed at the Discovery Cart engage and educate visitors using a series of themed information kits (themes currently include Invasive Plants, Native Tree ID, Animals of the Ravines, Insects of the Ravines). There will be educational props to help explain information, answer questions and facilitate activities with the public. Full training on all the information you need will be provided and you can then enjoy sharing your knowledge with others. Skills required: an outgoing personality, good communication skills (listening as well as speaking,) knowledge of and enthusiasm for TBG (training provided), an interest in learning and then conveying that knowledge to others, a winning smile, comfort with an active, on-your-feet role for a 3-hour shift, able to connect with people with ease and be responsive without being overwhelming. We occasionally have positions available for volunteers with office skills. These usually require good competency in computer programs and system (e.g Microsoft Excel, Raisers Edge). If opportunities arise of this nature they will be featured on this website and in our ENews. Professional quality images are needed of both the gardens and our events for TBG’s publications and our website. Must have own equipment and editing software. Photo credits can be provided. In addition to helping TBG, the benefits of volunteering for us include special volunteer rates for applicable TBG programs, special volunteer discount at the TBG Garden Shop as well as volunteering in beautiful surroundings! 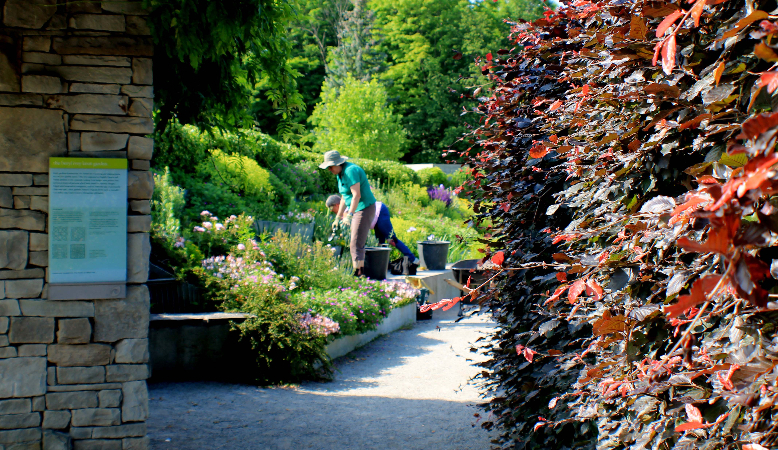 The Toronto Botanical Garden welcomes groups from many organizations who volunteer as a team in our beautiful gardens. The teams have a great time working together, pick up some gardening knowledge (and knowledge about the TBG) along the way, and the TBG has some wonderful and enthusiastic additional help in our gardens — a win win for all! A typical team volunteering experience with TBG includes hands-on gardening, learning about many aspects of organic gardening practices and being active outdoors. Depending on the season, a team’s activity could be planting, garden maintenance, feeding the garden and/or growing plants. Instruction is provided from the Head Gardener and/or other experienced garden volunteers to ensure a safe, professional and enjoyable team building garden experience. Tours and lunches can also be arranged. Please note bookings for garden volunteering for 2019 are now full but there may be a few opportunities for teams to help with special event prep and set up. Teams are booked on a first come first served basis. Maximum team size is 20 and please note participants must bring their own gloves and wear socks and closed-toe footwear (no dress shoes, sandals or flip-flops). If you are interested in volunteering with the Toronto Botanical Garden the next step is to complete and submit the volunteer application form on this website (or submit your resume). You will be invited to an interview to discuss volunteering in more detail and assess best fit. WHAT DOES TBG LOOK FOR IN OUR VOLUNTEERS?